At SIHH 2016 Audemars Piguet stacks two balance wheels on a single staff and frames them with a skeletonized new movement in a Royal Oak case. The verge escapement is the oldest form of escapement, although its origins still remain uncertain. George Graham’s cylinder escapement, invented circa 1725, proffered superior accuracy when compared with the verge escapement. Later, in 1754, Thomas Mudge invented the lever escapement, the forerunner of today’s Swiss lever escapement. However, arguably the biggest advance in the pursuit of precision must be attributed to Abraham-Louis Breguet and his invention, the tourbillon, patented in 1801. Breguet’s idea of placing the escapement within a rotating cage was inspired. The positional errors of the hairspring are countered as the cage turns through 360°. Audemars Piguet itself improved precision with its AP Escapement in 2006. The direct impulse design features two concentric hairsprings inside a single, high-speed balance wheel that maintains a strong equilibrium to provide chronometer-worthy precision. Three years later, Audemars Piguet debuted this escapement in the Jules Audemars Chronometer, which won the GPHG award in 2009 for best men’s watch (and remains available in the Audemars Piguet lineup). 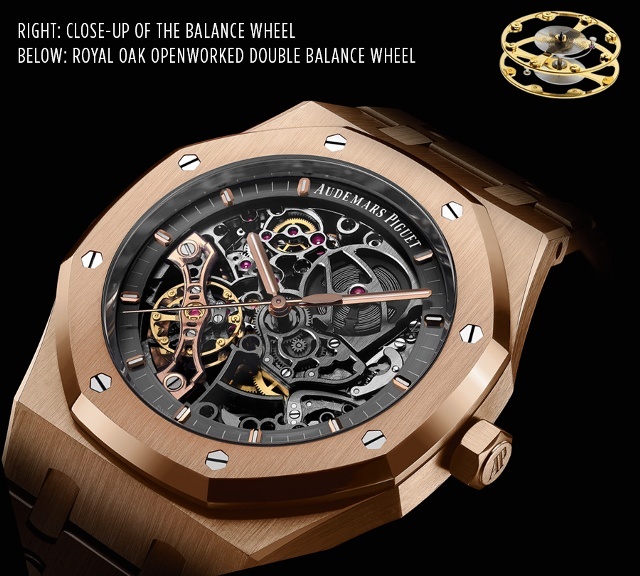 Now, Audemars Piguet takes the notion of dual-balance precision to new heights, courtesy of the new double balance wheel fitted to its latest iteration of the iconic Royal Oak timepiece. With this new timepiece, a world first, Audemars Piguet has equipped the movement with two balance wheels, each with its own hairspring, mounted on one common staff. The two balance springs work in opposition. The result of this is improved precision and stability, surpassing the chronometry of a tourbillon and negating any potential poising errors, as well as offering improved stability. Since the 1930s open-worked or skeletonized watches have been a specialty of Audemars Piguet. The spectacle of being able to view numerous micro-components proves an enticing prospect for any inquisitive purist. The resultant work should disclose the inner beauty of the movement without compromising its structural integrity. I have scrutinized the movement of this new timepiece with a loupe and soon became lost in a world of macro-powered splendor where brushed, chamfered, decorated and engraved components sit side by side in resplendent poise. A notable example of the no-compromise execution is the hand-applied finish of all the Caliber 3132 internal bridge angles. Furthermore, close scrutiny of the anglage reveals no traces of milling or spark erosion. Each bevel is free of twisting or distortion and presented in peerless form. When Gérald Genta penned his legendary Royal Oak timepiece in 1972 I am sure he could not have envisaged its huge commercial success nor the sheer number of variants that would evolve from the very first design. The octagonal form continues to seduce, with each bezel facet dancing with light with the same ethereal beauty of a twinkling diamond. Audemars Piguet offers the Royal Oak Openworked Double Balance Wheel in a choice of steel or rose gold, presented with a slate-gray dial and rose gold applied hour markers. In my view this watch magnificently showcases a new chapter in the sphere of Haute Horlogerie, courtesy of the high precision conferred. Moreover, this new development sits juxtaposed with traditional hand craftsmanship, brilliantly exampled, courtesy of the openworked movement. The Royal Oak Openworked Double Balance Wheel presents its freely disclosed, skeletonized movement via both sapphire crystals, front and back, revealing its own distinctive style. Each balance oscillates to and fro, flirting with the wearer and dancing with a seductive sashay. Indeed, despite being an admirer of the Royal Oak for many years, I genuinely feel Audemars Piguet has produced the finest iteration of this octagonal icon to date. 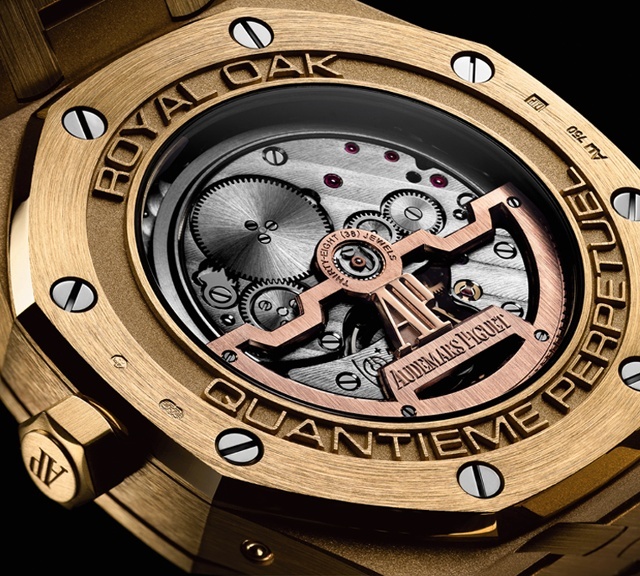 Audemars Piguet’s Royal Oak was among the very first luxury watches to treat stainless steel like a precious metal. This year the company is re-introducing the original timepiece precious metal, yellow gold, to the Royal Oak collection with this perpetual calendar. 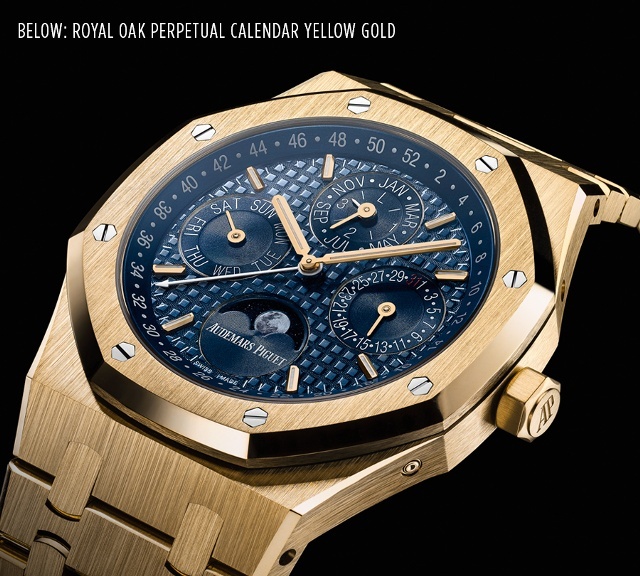 Based in part on the 1984 Royal Oak perpetual calendar designed by Jacqueline Dimier, this new model displays its calendar displays as such: month and date are displayed at nine, noon and three o’clock, the leap year indication (which Audemars Piguet first introduced to wristwatch design in 1955) is at noon. Furthermore, the astronomical moon can be seen at six o’clock while the week of the year is displayed on the dial’s outer chapter ring. The blue dial with the firm’s well-known Grande Tapisserie pattern features yellow gold applied hour-markers and Royal Oak hands with luminescent coating and a blue inner bezel. Within the 41mm case you’ll find new caliber 5134 fully visible through the sapphire crystal caseback. Caliber 5134 is based on its predecessor, Caliber 2120, but the new movement has been enlarged to perfectly fit the updated case size.